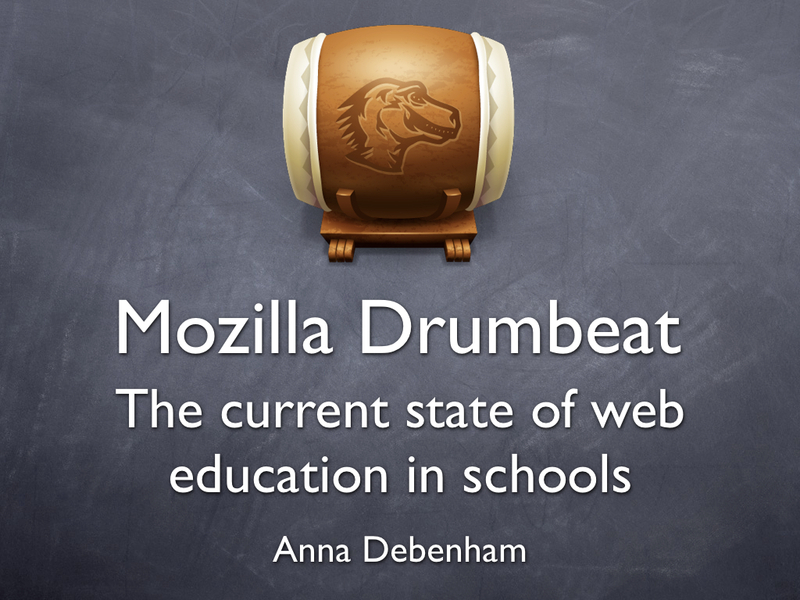 Anna Debenham brought the house down with this outstanding presentation at last week’s Mozilla Drumbeat Festival. The key take-away: web education in too many schools — both at the high school and university level — is out of date, lousy, and losing students. So much so that it’s threatening our countries’ digital and economic futures. Younger students often have nowhere to turn if they want to learn web design or development. Serious training often isn’t available until the post-secondary level — despite the fact that the most talented developers (like Anna herself) start early. 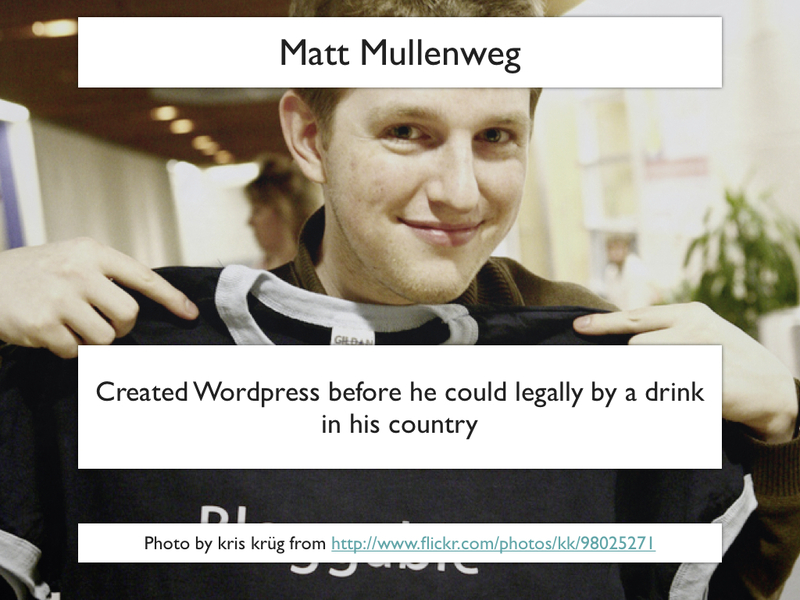 Matt Mullenweg, for example, created WordPress.com before he could legally drink. And Anna’s colleagues launched their own online business (UploadRobots.com) while still in the fifth grade. High school and university curricula is often out of date, teaches bad practice, or is just plain wrong. The official UK high school curriculum, for example, instructs students in cutting-edge practices like “the use of tables to position text and graphics” and “using Microsoft Word or PowerPoint to create web pages.” And the largest academic institution in Europe lags behind Wikipedia in defining basics like HTML. Students are dropping out as a result. Not surprisingly, studies report that the best students are “insufficiently challenged” by the poor quality of what’s offered. 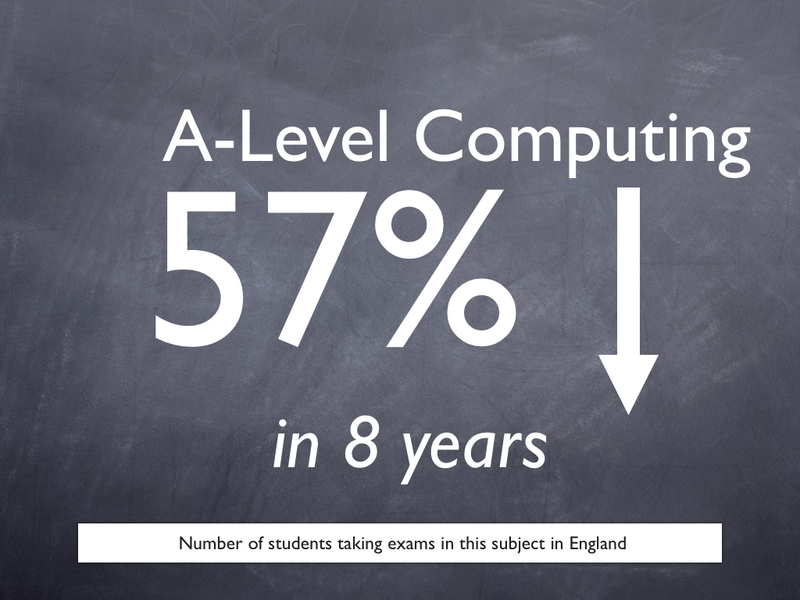 The number of UK students taking A-level computing courses has dropped 57% in 8 years. 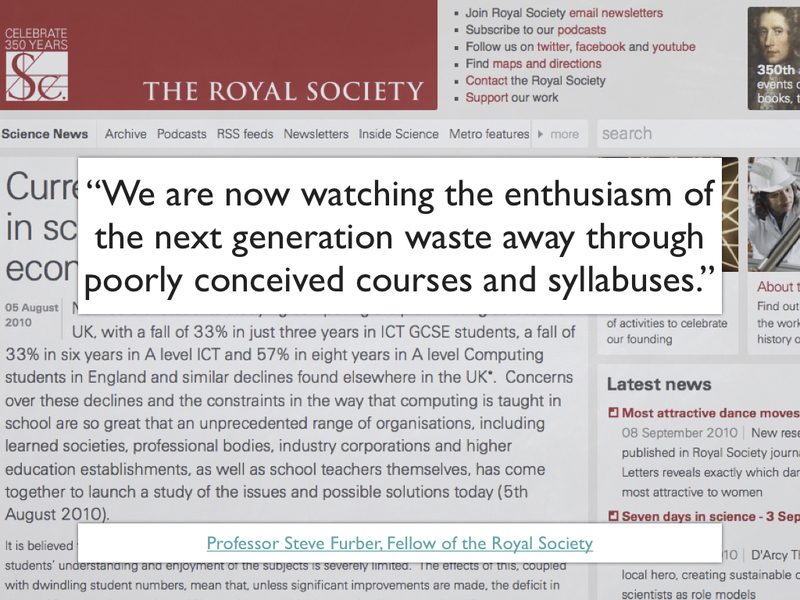 And the number of UK girls studying computing beyond age 16 has dropped to an all-time low. 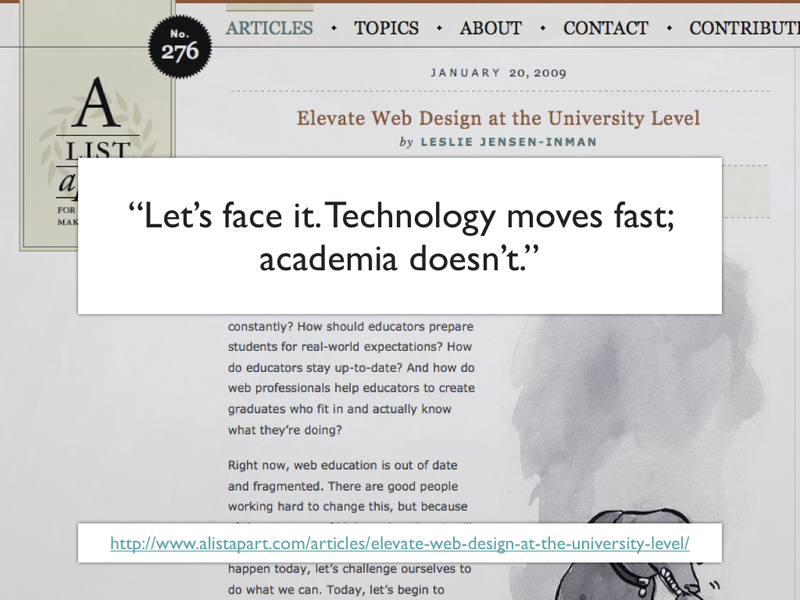 Web education that’s more like the web? Last week’s Drumbeat Festival was full of folks tackling these and related problems. But Anna’s examples paint a pretty grim picture: current web education practices in schools resemble teaching the use of bloodletting in medicine or instructing automotive students in the wonders of the Model T.
One thing seems certain: for the system to improve, it’ll take communities of young innovators like Anna helping to reinvent and update not only schools’ curricula, but their overall approach to teaching the web. Replacing top-down models with more fluid, peer-led classes where teachers can accept and make a virtue out of the fact that many of their most talented students will know more than they do. Creating those solutions in an open and scalable way would be a massive but worthwhile undertaking. Could be a great potential Drumbeat project? This will not change whilst education is lobbied and given heavy discount on proprietary software tools. Notepad is as equally capable of building the next world-changing website as anything you can buy. Well, as a matter of fact, even Notepad is a proprietary software tool. Vim can do everything that Notepad can do (and more), it runs on more platforms (including Windows, Linux, MacOSX, etc., even to zOS) and its help system is second to none. But, yes, it is still a plaintext editor, and nothing more is required to build a “world-changing website” in HTML, CSS, PHP, etc. I’m taking A-Level Computing right now at AS with AQA. I feel quite worried after reading this; this is absolutely correct, and I can’t believe I haven’t noticed. I feel so lucky to be of a microscopic minority that actually understands what HTML is. I don’t want to sound cocky, but my understanding of web standards is far greater than my teachers’. I’ll support this drumbeat however I can. I hope our schools will hear the sound of the drums before it’s too late for my peers. Maybe you should get in touch with Prof. Dr. Juraj Hromkovic, who is complaining about exactly the same failures in educational systems since years (with a focus on computer science in general, not just coding and designing for the web). He is very engaged on that topic and working with him might be an opportunity to leverage the effect of a project as you might plan it. What’s really sad is that businesses come to the school for free websites, and wind up with stuff generated by Fireworks with Google listings like “FINAL_6.jpg” instead of a title relevant to the business. The school also doesn’t help them make informed decisions about hosting, so trying to improve some of the client’s sites is difficult (no PHP or databases). It’s a terrible situation and I feel bad for the businesses. I wish you guys luck in fixing this problem! I think I’ll talk to my instructor next year when I’m taking web design again and see if we can improve the course. 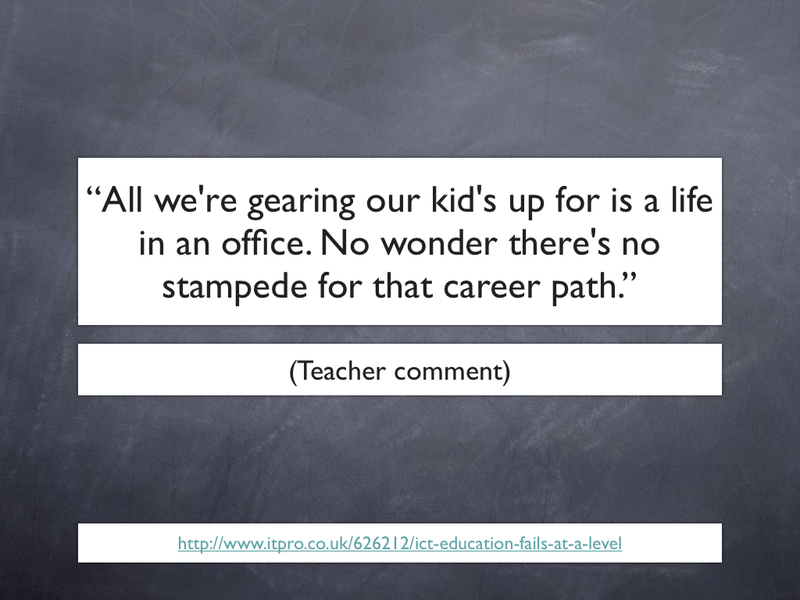 A couple of years ago I studied ICT at GCSE followed by Computing at A Level and everything here rings so true. The only reason I’m doing web design now is because of my own experimentation to try things out and learn HTML myself rather than anything I was taught at school or college. Had I not stumbled upon it myself I would never have considered it as a career. Even with an assignment to make a website, it was assessed purely through print outs and no HTML was ever required, let alone taught. With so much outdated and incorrect information a huge number of creative people may fall through the system and miss the opportunity to enter a career that could be perfect for them. @ Matt Robin: Thanks Matt! Fixed now. 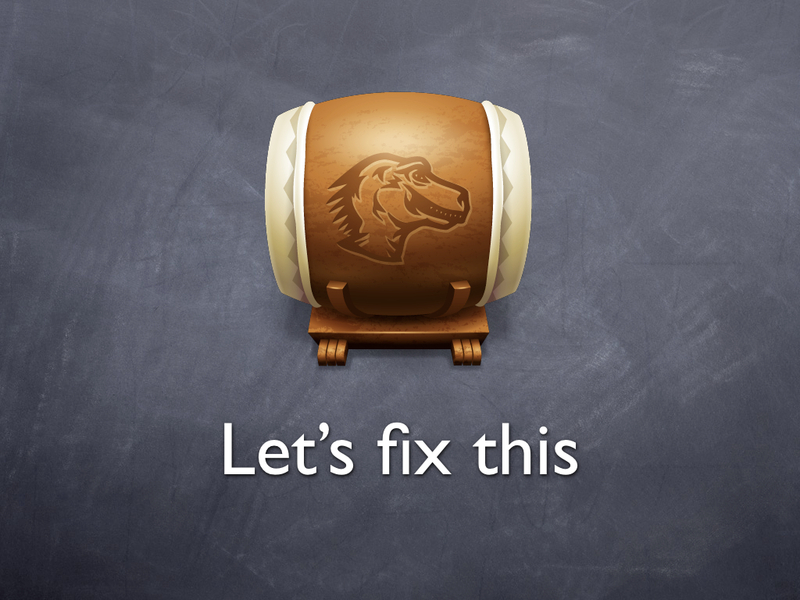 Why don’t highly trained, highly knowledgable web developers go into teaching? The follow-up question could very well be: Who would? What could possibly beat the immediate satisfaction of learning new stuff, solving bugs and seeing your creations come to life? And being paid too! Even with bad stuff like compatibility issues, there is the comfort that the situation is fixable or can be proven to be unfixable. After all, it’s just logic. Students can be messy to deal with, and they can be disrespectful as well. And high teaching evaluations doesn’t necessarily mean the teaching was effective. And there’s the added problem that there’s simply not enough class time to teach everything needed, even with highly talented students. But in the end who gets blamed: the teacher! @ Lea: your post is amazing! I’ve forwarded it into several colleagues. All these great comments lead me to believe that a) Anna has hit a real nerve here. This is a widely recognized problem. And b) that it’s solvable. There are smart educators already developing solutions, and smart students ready to help.